Family celebrations such as Christenings, birthday parties, lunches and any other personal family celebrations we will take care of your needs for the day. A Christening can be as important a celebration as a wedding. The celebration of a child joining Jesus' family and being a part of the Christian community is something to be celebrated indeed! And we will help you with the preparations and enjoyment of what is a truly beautiful part of a family's life. A birthday celebration is always a good time to get family and friends together to celebrate. 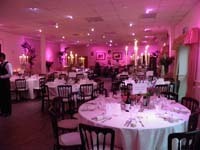 Whether its a 1st or 90th birthday we can help you plan your day. Office Christmas parties can be a chore to organise. We are experienced at taking the pain out of it. Trust us to organise your food, drink and entertainment for a fun filled evening to thank your staff for the year's hard work. Please call to arrange a meeting and we can sort everything out for you for a price per head. When a family member passes it can be the most saddest time. We offer a sympathetic ear and listen to the family's needs in terms of a wake. We will help you with the catering and setting up the venue to make that personal tribute to those who have passed and enjoy bringing family and friends together.